WORCESTER — Quinsigamond Village may seem like an unlikely location for a new, massive distribution center, but developers say the location is prime — next to Route 146 and the Massachusetts Turnpike and surrounded by one of the largest inland rail ports in New England. Senate Construction Corp. completed the approximately $29 million project at 150 Blackstone River Road on 36 acres west of Route 146 that had a blighted 632,000-square-foot vacant building on it. The development group – 150 Blackstone River Road LLC – was formed in 2013 through a partnership between Mid-States Packaging, a tenant of the property for more than 30 years, and GFI Partners, a real estate development company. It took less than 18 months to build the 635,000-square-foot distribution center, including office space on the second floor that is about 10 percent of the total square footage, said Steven E. Goodman, president of GFI Partners. The old U.S. Steel factory, which had been largely vacant since the factory closed in the mid-1970s, was demolished. Senate reused the old foundation and used some of the steel salvaged during the demo. Use of the old foundation preserved the old structure’s grandfathered exemptions to current building codes. Railroad tracks owned by the Providence & Worcester Railroad Co. run through the property. GFI has been active in Worcester since the mid-1980s and has completed more than 11.8 million square feet of redevelopment and new construction of industrial property. Mr. Goodman said the city was instrumental in making the Blackstone River Road project happen. During the planning process, it was estimated that construction of the multi-use, high-bay industrial building would increase the total assessed value of the property from $10.2 million to $31.45 million, though Mr. Goodman declined to provide the exact figure. The redevelopment project will receive a $5.4 million tax break from the city over a 15-year period and is expected to generate at least 300 jobs and $1.4 million in property tax revenues annually. “We worked closely with Tim Murray and his office, with the City Council … (City Manager) Ed Augustus – he was pushing hard for this,” he said. “Everybody was great here. We worked hand-in-hand with the building inspector, John Kelly, who fast-tracked the project and kept it moving and helped us work through a complex redevelopment of an old site that had a lot of historical infrastructure. The TIF (tax increment financing) made this project possible. Once we got that from the city, we were able to attract tenants. The project is one of the largest construction and redevelopment projects in New England, said Senate Construction CEO Robert D. France. Founded in 1990, Senate Construction is considered one of the leading commercial construction companies in the state. From the groundbreaking to the first tenant moving in was about 14 months, he said. G-3, a wine distributor, takes up 230,000 square feet of the building in a space with ceilings 36 to 42 feet high. Solar panels were stored there before they were installed on the building’s roof. They are expected to provide additional revenue to GFI from the 3.17 megawatts generated and sold to the grid. 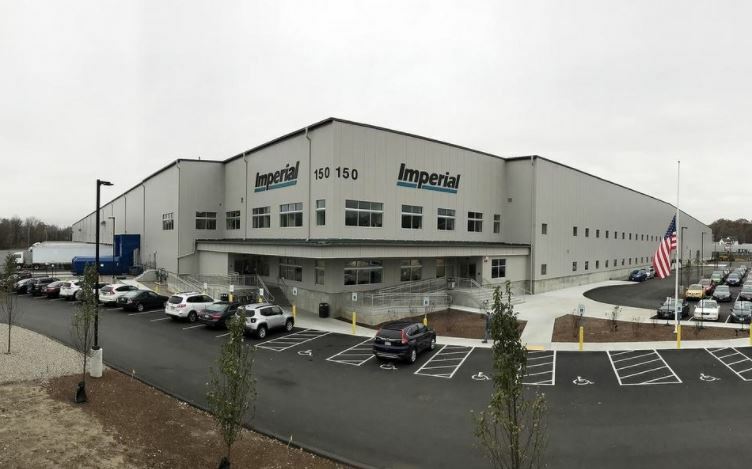 Imperial Distributors, which delivers non-food products to more than 3,500 locations, including supermarkets and other retailers in about 20 states and which has facilities in Worcester and Auburn, takes up about half of the square footage. Imperial consolidated five different warehouses into the facility and brought 300 jobs back to Worcester, officials said. Mid-States Packaging, a transportation and logistics company that uses trucking, rail, sea bulk and warehousing assets to transport freight across the country, occupies the balance of the space. Mid-States management said previously it chose to stay on as a tenant because of the site’s prime location, with close proximity to major highways and railroads, as well as its long-term commitment to the city. The building was designed to attract local, regional and national distribution companies, Mr. France said, as well as third-party logistics, light manufacturing, assembly and warehouse companies looking to serve the region and the greater New England area.